In this simple example, we only need three levels to construct the tree for RC (we would need more for RA or RD, however.) 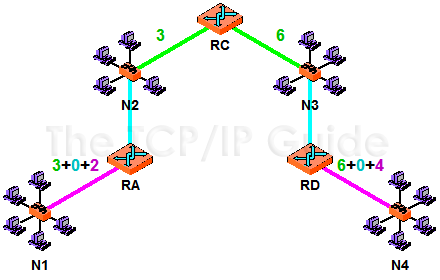 The final results would be the tree in Figure 183, and the routing information for RC to the four networks that is shown in Table 125. This is a graphical representation of the SPF tree calculated in Figure 182, showing only the final results of the calculation process. This of course is what you would expect in this very simple example. Note that there are no specific entries for other routers, since they are the means to the end of reaching networks. However, if one of the other routers were a boundary router that connected the AS to the outside world, there would be entries for the networks to which the boundary router connected, so RC knew to send traffic for those networks to that boundary router.